Pianist Miroslav Kultyshev, top prize-winner at the 2007 International Tchaikovsky Competition, rendered a deeply satisfying performance of works by Beethoven, Schumann, and Chopin for a full house plus at BU’s Tsai Center on Wednesday evening. The program was presented by Boston University in collaboration with the Educational Bridge Project. Kultyshev projected calm even as he walked on stage, barely showing a Mona Lisa-like smile (clear potential for orneriness) with a head-tilted bow, as he placed himself at the piano. He began with the 11 Bagatelles, Op. 119 of Beethoven, the works taking only slightly more minutes to perform than their numbering. The first of these short pieces were apparently sketched well before what the opus number would indicate, and it’s not entirely clear that Beethoven intended all eleven pieces to be published and performed all together, though they certainly work fine as a group. Kultyshev established an immediate mood. His big eyes projected upward, his playing was hyper-clear, lyrical, with long melodic lines and phrases, but down to earth, simple and humble, as Beethoven (it has been said) would have wanted. Inner voices were projected. The works came across as a series of vignettes, but also as short songs, duets, and dances, with requisite instrumental (piano) latticework. Really lovely, the works were rendered from bright to dark and bright again, from soulful to playful, often with an almost abrupt, tender close. Beethoven the Classicist was present here, not Beethoven the Romantic or Mystical. Kultyshev might concur, by his generous, passionate yet structured performance. Despite the incredibly dry hall, he brought a richness of sound wrapped in a gentleman’s cloak. And if, like me, you’re a sucker for a great circle of fifths, you would have breathed more deeply when he arrived at the poignant ‘development’ section. The movement ended quietly, Adagio, with a reverential quote of Beethoven’s song “An die ferne Geliebte,” with hints of the song having come earlier. In the slow section of the faster, bouncier 2nd movement, there was an occasional lapse (tiny) of concentration, when the pianist was plotting the beginning of the next phrase before ending the previous. He was listening ahead. That said, there was more stateliness, and the thrill of all those articulated dotted-note leaps driving to the end. Kultyshev paced and built to those incredible climaxes of the final movement, and he stayed in rhythm, in effect, by cutting the tempo precisely in half! While the first movement brought deep breathing, his playing here brought more drawn (held) breath. The work ended not with the final chord, but with a 20-second silence in the hall. And, romantic notions aside, Kultyshev had plenty of energy in reserve. More vignettes followed intermission in the full book of 24 Chopin Préludes, Op. 28. Concentrated vignettes. For this listener, the order of events made the Chopin sound much like a hybrid, for lack of a better word, of Beethoven and Schumann. I also can’t explain why I find the Préludes to be the most Schumann-like of his oeuvre (though they are clearly a tribute to Bach). The first Prélude in particular seems all-Schumann, with a quivery, restlessness that Kultyshev projected with equal yearning. If a pair of large, angry turtles could sing underwater while marching slowly forward, attempting to harmonize (thus the anger perhaps? ), they might sound like the bass of the 2nd Prélude, so bizarre sounding it is. 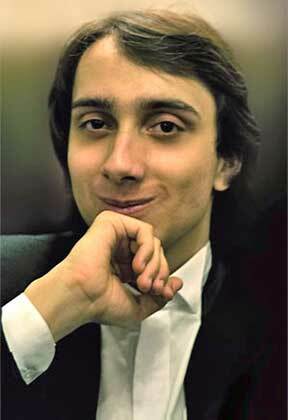 Sorry, Mr. Kultyshev, to describe your playing as such, but I mean it well. The 3rd Prélude was tossed off with such clarity and delight that it brought back to the pianist’s face that whisper of a smile we witnessed at the outset. The 4th, the famous E-minor Prélude, was lovely, and spoke to Kultyshev’s ability to sustain and project a melodic line. For anyone who wishes to encounter an entertaining “analysis” of this Prélude, watch Benjamin Zander’s TED talk here. There was the same projection of melody for the equally famous “Raindrop” Prélude, though the performance—no fault of Kultyshev’s— was marred by 20 seconds of shrill phone accompaniment. He brought the same power to the center of this piece as he did to the climax of the 3rd movement of the Schumann, with the same slight pause before delivery of the biggest chords. What could have sounded like an aberrant effect sounded perfectly natural, for its consistency. With these Préludes, we were also offered glimpses into the composer’s larger universe. The sixth Prélude is reminiscent of the ‘cello’ etude, Op. 25, no. 7. The 8th Prélude relates to the first Etude of the Op. 25 set, but is still radically different. Sometimes the images cast unusual reflections, creating vastly different portraitures while retaining the DNA of referential repertoire. Many of the Préludes call to mind ‘partner’ etudes, but some point to works written later. No. 14 summons the last movement of the Sonata in B-flat minor Op. 35. While no. 22 conjures both the 1st and 2nd movements of that sonata. For Chopin lovers, this amounts to a Chopin smorgasbord, with memory and musical associations included prix fixe! (no extra charge). Kultyshev presented each Prélude as its own tiny course, some quite rich and filling. He was never showy, though the Presto con fuoco, no. 16, was a thrilling roller coaster ride, every 16th note clear over a propulsion-like octave base. I think I saw that smile turn a bit ornery at the end of this Prélude. The gorgeous Cantabile Prélude, no. 21, might have benefitted from even more full-tilt Schumannesque abandon, more crescendo to each bar, but who’s to quibble? The final Prélude in D minor! It’s Chopin’s Mr. Hyde to his own Dr. Jekyll, which would be his D-flat Nocturne, Op. 27, No. 2. The latter, dreamy, lyrical, over an undulating arpeggio-based base. The former, a relentless arpeggio base, with the Nocturne theme turned and dragged on its head with brute force, wicked scales, terrible octaves and screaming double thirds. Superbly controlled rage from Kultyshev. Ending with three remorseless thuds. Kultyshev the executioner, so to speak. A good size ovation from a demanding house led to three delicious encores. First, a Chopin Etude, Op. 10, No. 8 in F Major, tossed off with a charm and capricious lilt, chameleon-like color shifts in the center. Then, Tchaikovsky’s Meditation, naturally rendered, sounding as if Kultyshev was improvising over the return of the melody. And finally, Tchaikovsky’s un Poco di Chopin, a work sounding like a tribute to Chopin’s more eastern sounding Mazurkas, satisfyingly pensive and expressive, earning much appreciation from this audience. Kultyshev did not let his hair down for the encores. He didn’t need to. He was his relaxed, centered self the first moment he set foot on stage, and no doubt before, and after. How rewarding it must be to play with so little anxiety. And how rewarding for us. I had an entirely different reaction to this recital, although I do agree with one comment of the reviewer. Kultyshev’s playing was indeed “hyper-clear.” Several bars into the staccato opening of the first bagatelle I had the sense that this was going to be an extraordinary recital. But then the clarity of the playing started to interfere with the music, and it seemed to me that each bagatelle dissociated into miniatures within a miniature. This carried over into the Schumann, where the melodic lines were undermined by too much preoccupation with “clarity” in the embedded harmonic texture. The essence of the music was, for me, lost. I didn’t stick around for the Chopin, thinking that it would be treated like the Schumann. If Haydn, or even Bach, were on the program, I would have stayed. Having heard this performer twice in the last week, what I found especially pleasing was the way he ended many pieces, like numbers 6 and several following, of Chopin’s Etudes No. 10 — with delicate, beautifully paced pianissimos, a welcome quiet. A few endings aside, it was almost unrelievedly powerful and loud Friday; I’m not sure I’ve ever heard anything like it, such a huge rich sound in a nonlarge space. Some of the clatter and splatter another pianist in the audience speculated was harmonics-related. Not sure how that works, but it wasn’t simply missed notes. Yes, many, maybe most keyboard kids today have Popeye forearms, which evidently fight off fatigue, after a fashion.